Tour leader Tita Berger helps tour participants visualize the efforts of the CCC that went into building the Elephant Butte Dam Site. Nearly 40 members of the New Mexico Architectural Foundation visited Truth or Consequences on Saturday, Oct. 25 to learn more about the community and historic architecture of the town. Each year the Architectural Foundation hosts a daylong tour with the purpose of increasing public understanding and appreciation of the state’s diverse architecture. This was the 27th tour (view listing of past tours). 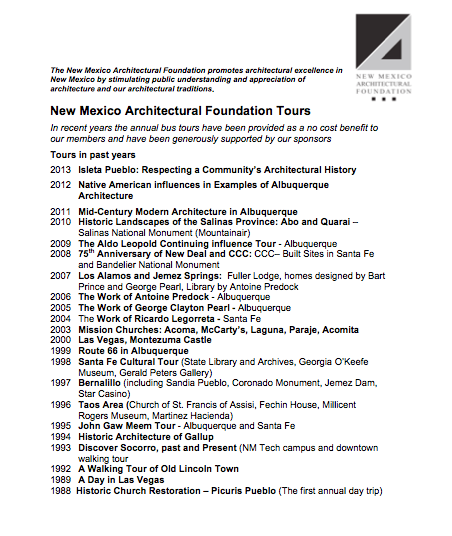 The Foundation’s tours have always been about bringing together people interested in our built environment – both non-architects and architects enjoy a day’s worth of New Mexico specific works,” said John Briscoe, the Foundation’s chief tour planner and a retired Albuquerque-based architect. The tour began at the Lee Belle Johnson Center where historian and 6th generation town resident Sherry Fletcher provided an introduction to the history of the city and historic photos were on display. Tita Berger, Ph.D. candidate in American Studies at UNM and Tor C area resident, then led the group with Fletcher on a walking tour through downtown to highlight key buildings and the historic bathhouses. Berger, who is writing her dissertation on the community of T or C, was instrumental in the planning the details of the tour. Sierra County is home to more than a dozen buildings and projects that were constructed during the “New Deal” years (1933-1943) through the Works Progress Administration (WPA) and related programs. Some say that President Roosevelt’s New Deal programs enabled architects, artists, and artisans to create twentieth-century masterworks. In addition to the WPA sites, tour participants also visited the Elephant Butte Dam Site. Many of the amenities at the site were constructed by the New Deal’s Civilian Conservation Corps (CCC) preceding WWII. Of architectural significance at the site are the stone columns and walls that make up the pergola and beautifully frame the lake views, the fifteen tourist cabins, and the boathouse. Truth or Consequences also features unique and colorful “vernacular architecture” of interest to the tour participants. Vernacular architecture is based on local needs and construction materials and reflects local traditions. Other examples of vernacular architecture in T or C are the numerous bathhouses, many which are constructed using adobe and other local materials. Learn more about our TOUR SPONSORS who helped make this event possible.